Thanks to Dr. Jitendra Khedkar, Krishna Institute of Health Sciences University, India, for contributing this case and the discussion. To contribute a Case of the Week, follow the guidelines on our Case of the Week page. (1) To all reviewers / Case of Week contributors: we are now requiring you to provide us basic information (name, mailing address, US tax ID number (if any) and nonUS tax ID number (if any) to enable us to comply with US tax laws. We will send a 1099 form to US residents who earn $600 or more in any calendar year. For non US residents, unfortunately we must withhold 30% of all payments, and forward this amount to the US government (see IRS document). You may be able to get this money refunded - you should check with your tax advisor. Unfortunately, we are unable to give you tax advice. We will apply this rule to all new work started after today. If you change your mind about wanting to contribute cases or review topics, just let us know. We apologize for the change, but we have no choice. (2) We posted a new article on our Management Page: A Managed Care Contracting Plan for Independent / Outreach Labs, Or How to stay profitable even if Medicare cuts your rates - Part One, by Mick Raich, President, Vachette Pathology. (3) We have updated the Lung tumor chapter based on reviews by Drs. Deepali Jain and Fulvio Lonardo. 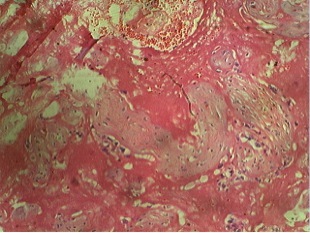 A 22 year old primigravida woman with 25 weeks of amenorrhea presented with a rapidly enlarging abdomen and discomfort. Ultrasound at 25 weeks revealed twins. One twin had severe oligohydramnios, intrauterine growth restriction and was considered a "stuck" twin (donor) with gestational age of 20 weeks. The other twin (considered recipient) had polyhydramnios and gestational age of 25 weeks. At 30 weeks, amniocentesis was performed to correct the polyhydramnios. At 35 weeks, caesarian section was performed to save the twin with polyhydramnios (the other twin suffered intrauterine death). 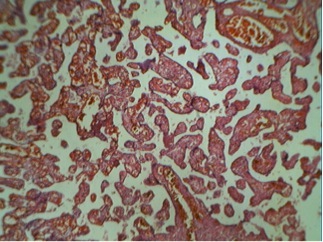 The placentas were received for histopathological examination. 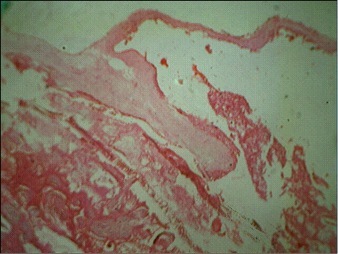 Figures 1 and 2 show a single placental disc with two amniotic sacs of dissimilar size separated by a thin, wispy dividing membrane. 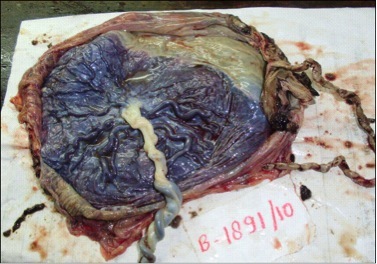 The external surface shows tortuous anastomotic vessels, with the donor placenta showing velamentous insertion of the cord. 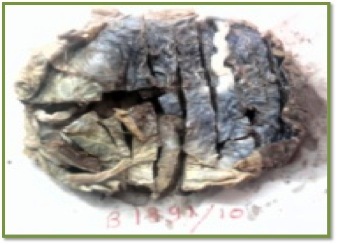 Figures 3 and 4: the cut section of the recipient territory shows extreme congestion and tortuous vessels. 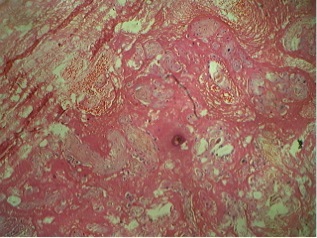 The cut section of the donor territory shows extreme pallor and collapsed vessels. 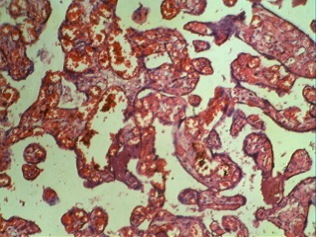 Figure 7 and 11: microscopy of the donor placenta shows collapsed vessels and features of intrauterine death. 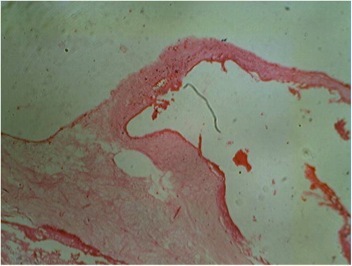 Figure 8 and 12: microscopy of the recipient placenta shows tortuous anastomotic vessels. Twin transfusion syndrome (TTS) is a serious condition that affects 10% to 15% of twin pregnancies with monochorionic diamniotic placentation, as well as other multiple births with a monochorionic placenta (Semin Perinatol 2012;36:182, Wikipedia). 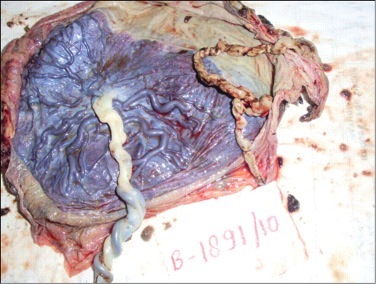 It occurs due to intrauterine blood transfusion from one twin (donor) to another twin (recipient) through placental vascular anastomoses from shared placental cotyledons. 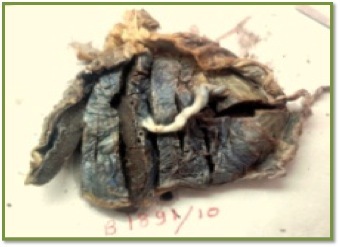 This results in increased fetal and neonatal mortality, premature delivery and neurologic complications in the surviving twin(s) (PathologyOutlines.com).